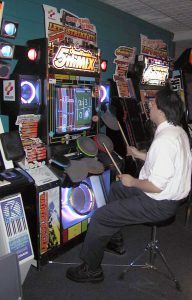 The other game I am gaining some proficiency at is Drummania. 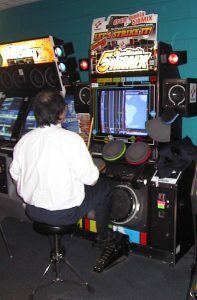 It is a drum simulation game. Currently I can do I Only want to be with you in Advanced, Right on Time in normal, Shinatori in Advanced, Spring in Extreme, Sunny Sunny Day in Advanced, You Give Love a Bad Name in Extreme, Tenkaisou in Extreme, Power Of Love in Advanced, Galaxy Express 999 song in Advanced, Robinson in Extreme, Romance in Extreme and Innocent World in Extreme. So I am not good enough to beat a Honger or a FOB but I can look cool to the regular nobody.